Teaching kids about the benefits of fitness AND the benefits of helping others is one reason I am a big fan of Breakthrough Ministries new blog and new cause: Breakthrough Runners blog and the African Running Program. The Running program sends kids from East Garfield Park’s Breakthrough Ministries Running club to Africa to meet three of the Africa children the Chicago kids are sponsoring. 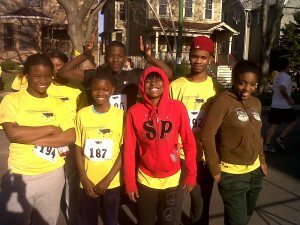 Breakthrough Ministries has been offering a boys and girls running club for students in East Garfield Park for the past two years. The club pairs adult mentors with adolescent students to train and run races each fall. While East Garfield Par ranks at the top of the city for crime and drug use every year and is one of Chicago’s most disadvantaged neighborhoods, it is teeming with brilliant and talented young students. According to one of the posts in Breakthrough Runners Blog about the kid’s devotion to running: Over the past 2 years of running club, the Breakthrough youth have consistently shown up to as early as 6am on Saturday mornings despite the weather. During the first year (09) our girls ran through hail and freezing rain on more than one occasion. Last year our boys ran on the lakefront during a day in which the winds blew with gusts up to 60 mph and the sand from the beach mixed with rain was literally cutting them till their legs bled as the ran. A representative from World Vision helped 6 runners from Breakthrough Running Club (Nick, Tony, Alesha, She-She, Ashley and Cheyenne) find children to sponsor AND for the Chicago runners to meet in a remote villages in South Africa, through World Vision’s Child Sponsorship Campaign. World Vision is a huge humanitarian aid organization that is working for sustainable solutions to global poverty in over 100 different countries. The African Running Club was charged with finding child sponsorships (through World Vision) for 3 of the kids who live in area that they will be visiting on their trip to Africa. Thus far the Breakthrough Runners have found sponsors for 10 children in Africa. However, they still need sponsors for 8 more children to meet their goal of sponsoring 18 African children. The six Breakthrough Runners left Chicago today for their trip to visit the children they sponsor in Africa! Read all about it here. If you would like to help the Breakthrough Runners meet their sponsorship goals, email rfunk@breakthrough.org for more info about helping with sponsorship.